​Hometown: Toms River, New Jersey. Died: September 21, 2010 in Operation Enduring Freedom. Unit: East Coast based SEAL Team. Petty Officer 3rd Class (SEAL) Denis C. Miranda, 24, of Toms River, N.J., assigned to an East Coast-based SEAL Team. He died in a helicopter crash Sept. 21 during combat operations in the Zabul province, Afghanistan, while supporting Operation Enduring Freedom. He enlisted Sept. 10, 2003, and was advanced to E-4 on July 16. Before becoming a SEAL in 2007, he served at Patrol Squadron 8 in Jacksonville, Fla. He also attended hospital corpsman "A" school before entering Naval Special Warfare. He left his parents, Patricia and Christian Miranda; and his brothers, Alan and Kevin Miranda, all of Toms River; his maternal grandmother, Elsa Allegretti, of Argentina. He is also survived by his loving fiancé, Lacy Cromwell of Oregon; best friend/brother, Eugene Lewis III; and many loving aunts, uncles, and cousins in Argentina, and cousins in Spain. 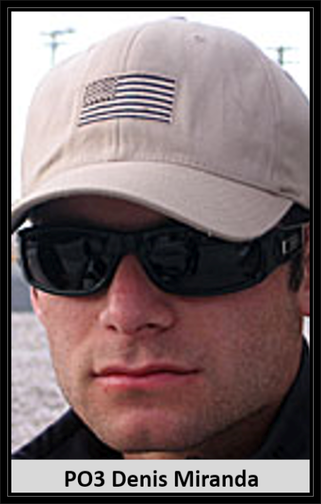 Denis Christian Miranda, Navy Seal, 3rd Class Petty Officer, of Toms River, died Tuesday, Sept. 21, 2010, in a helicopter crash, in Afghanistan, while proudly serving his country. Born Dec. 6, 1985 in Argentina, he resided in Japan for six months before returning to Argentina, and finally coming to New Jersey in 1987. A graduate of Toms River High School East in 2003, Denis joined the Navy soon after graduation. He became a Hospital Corpsman in 2007, entered BUD/S in 2007, and graduated as a Navy Seal in October 2008. He served at Patrol 8 in Jacksonville, Fla. Denis was honorable, spiritual, passionate, family oriented, hard-working, giving, loved by everyone, funny, life of the party, humble, gifted, courageous, and motivating. Left behind are his parents, Patricia and Christian Miranda; and his brothers, Alan and Kevin Miranda, all of Toms River; his maternal grandmother, Elsa Allegretti, of Argentina. He is also survived by his loving fiancé, Lacy Cromwell of Oregon; best friend/brother, Eugene Lewis III; and many loving aunts, uncles, and cousins in Argentina, and cousins in Spain. Sign dedicated on September 13, 2013. TOMS RIVER, N.J. — A Toms River High School East graduate who later became a Navy SEAL was among nine American troops killed in a Sept. 21 military helicopter crash in southern Afghanistan. Petty Officer 3rd Class Denis Miranda was one of four sailors killed in the crash in the Zabul province, Defense Department officials said. Five soldiers also died. Miranda graduated from High School East in 2003. He was a member of the school swim team. During his sophomore year in 2001, Miranda was picked by the Asbury Park Press as a key newcomer to the team. In 2002, he was picked as a key returning swimmer. Miranda enlisted in the Navy on Sept. 10, 2003. Before becoming a SEAL in 2007, he served at Patrol Squadron 8 in Jacksonville, Fla.
Carbone said he got to know Miranda better after he enlisted. Miranda would follow his two younger brothers, Alan and Kevin, through their swimming careers. Military officials have not disclosed the helicopter’s mission, and the cause of the crash was not immediately clear. NATO said there were no reports of enemy fire in the early morning hours in the Daychopan district of Zabul, where the crash took place. The Defense Department identified the other dead sailors as Lt. Brendan Looney, 29, of Owings, Md. ; Senior Chief Petty Officer David McLendon, 30, of Thomasville, Ga.; and Petty Officer 2nd Class Adam Smith, 26, of Hurland, Mo. TOMS RIVER, N.J. — Alan Miranda will always remember his older brother’s charity. Denis Miranda would help his parents, Christian and Patricia, by sending them money. He would remind his two younger brothers about the sacrifices they made to help raise them. 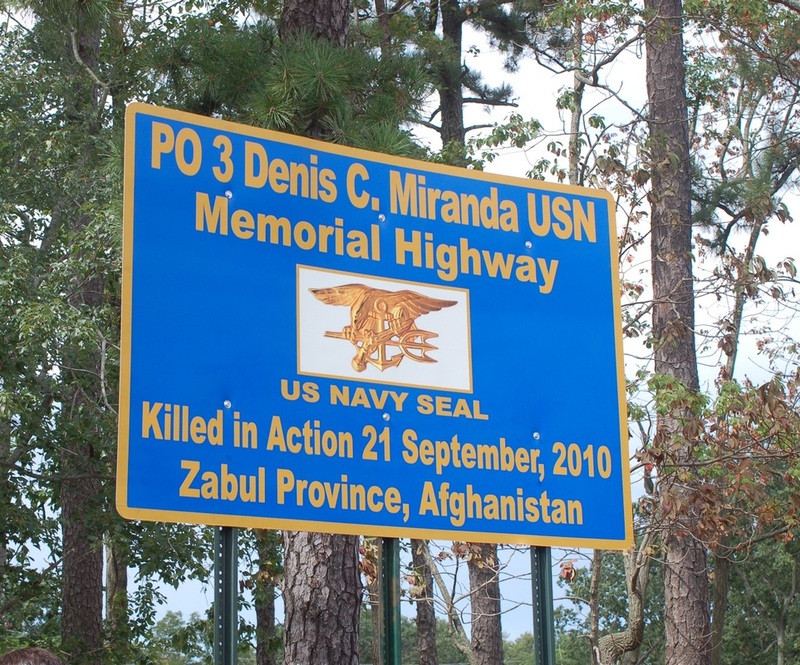 Denis Miranda, 24, a Navy SEAL who reached the rank of petty officer third class, was killed Sept. 21 with three other sailors and five soldiers in a helicopter crash in southern Afghanistan. Not so long ago, Alan Miranda was “chatting it up” with brother Denis on the phone. Denis Miranda was walking down the street in Fayettville, N.C., at the time. He suddenly stopped the conversation, asked his brother to hold on and dropped the phone to his side. After Denis Miranda gave the homeless man his food, he wished him a good night and told him to stay warm. Miranda wasn’t in Afghanistan long. He was deployed from Virginia Beach on Sept. 12, Alan Miranda said. Before Denis Miranda was deployed, he proposed to his girlfriend of three years, Lacy Cromwell, who is also a sailor. The couple first met at training in Florida, and got into a relationship later. They met again on the street in downtown San Diego when both were assigned to the Navy base there, Cromwell said. They became fast friends. They spent as much time together as they could, she said. Within three months their friendship became romantic. Denis Miranda enlisted in the Navy on Sept. 10, 2003. Before becoming a SEAL in 2007, he served at Patrol Squadron 8 in Jacksonville, Fla.
TOMS RIVER, N.J. — Under a gray sky, hundreds of people lined the streets of downtown Toms River to pay homage to a man few of them ever knew. As a funeral procession wound its way through the downtown, government employees, veterans and residents lined the streets waving flags. They were there to honor Navy Special Warfare Operator 3rd Class (SEAL) Denis Miranda, 24, who died Sept. 21, a little more than a week after being deployed to Afghanistan. Miranda’s remains arrived early Sept. 27 at Joint Base McGuire-Dix-Lakehurst and were escorted to Toms River. Among the people who gathered to show support was township resident Jackie Robertazzi. She empathized with the Miranda family, sharing the fear of a mother whose child is serving overseas. Robertazzi’s son Jason was deployed with the Army to Iraq on Sept. 11. Her daughter Jennifer previously served six years in Iraq with the Air Force before returning safely. As police escorts led several black limousines back to Anderson and Campbell Funeral Home on Main Street, onlookers watched somberly as a military salute was held. Six sailors carried the coffin into the funeral home and were followed by mourning family members and friends. Miranda was killed with three other sailors and five soldiers when their helicopter crashed in Zabul province in southern Afghanistan. Miranda was deployed from Virginia Beach, Va., on Sept. 12, not long after proposing marriage to his girlfriend of three years, Lacy Cromwell, who also is a sailor. In a statement, Miranda’s family thanked the community for its support. David Perez, commander of Veterans of Foreign Wars Post 6063 in Toms River, simply planned to salute Miranda during the funeral procession. Deborah Capaccio, whose three adult children are police officers around the state, said she was there as a mother supporting a mother. The crowd grew quiet and respectful as the procession approached and watched with unwavering eyes as the pallbearers led the mourners inside. Before entering, the naval officers removed their hats as they entered the funeral home. With that, the crowd began to disperse.